The guitar is in great shape although I did have our luthier touch up some finish around the neck heel that was lightly flaked. This is a Bambino with a Jazz Attitude…this deluxe version maintains the dimensional specifications of the Bambino model but adds modern sound holes, a flamed maple veneer top, gold hardware, and a deluxe binding package (w/b/w/b/w) to the body, neck and headstock. The sound holes enhance the acoustic volume to the unplugged instrument and give the guitar a more traditional archtop look with only a single pickup placed in the rhythm position. 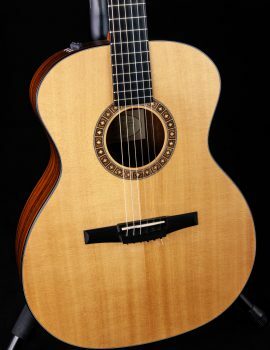 To show off the beautiful flamed top, this instrument is available only in Natural and Honey Blonde finishes.